Youth Safety Course coming up in Devils Lake on December 8th! Children over 10 years old are welcome to come learn and get certified about snowmobile safety on and off the trails! 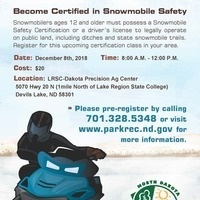 Snowmobilers ages 10 or 11 are now permitted to operate on public lands& trails provided they are under parental/guardian supervision and have completed the approved safety course and received a snowmobile safety certificate.